In Hoops, Major Jackson continues to mine the solemn marvels of ordinary lives: a grandfather gardens in a tenement backyard; a teacher unconsciously renames her black students after French painters. The substance of Jackson's art is the representation of American citizens whose heroic endurance makes them remarkable and transcendent. In his second collection, National Book Critics Circle Award-finalist Jackson (Leaving Saturn, 2002) pays tribute to timeless and timely monuments of American culture and history. Set mostly in an urban landscape, the poems range over a variety of addresses: one envisions neighborhood basketball as a metaphor for life ("The body on defense, / Playing up close, ghoulish, / Lacking grace, afraid / He'd go face-to-face"); others recall the trials and travails of adolescence or pay homage to writers like Shirley Jackson, Robert Frost, Langston Hughes and Gwendolyn Brooks. In one poem, a grandfather struggles to maintain his integrity in a changing world: "he has watched the neighborhood,- / postwar marble steps, a scrubbed frontier / of Pontiacs lining the curb, fade to a hood"; in another, a fourth-grade teacher unable to remember her students' names like "Tarik, Shaniqua, [and] Amari . . . nicknamed the entire class / after French painters." The long poem "Letter to Brooks," attempts to explain the contemporary scene to the Pulitzer Prize-winning poet who died in 2000. This book works to forge a large and spacious America, one capable of housing imagination. 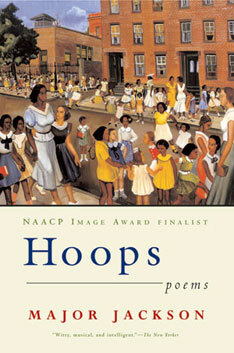 Hoops, by Major Jackson (Norton; $23.95). The slangy title of Jackson’s second collection is a layered metaphor, implying, among other things, basketball, jewelry, and life’s hurdles. Jackson seems to define himself by his eclecticism; he reveres basketball players as much as poets. Recalling his early life in a rough Philadelphia neighborhood, he draws nourishment from a sense of his acuity: “My breathing / was older than me.” His poems are witty, musical, and intelligent; he is equally happy discussing the war on terror—“An empire croons, toughed-up in a trance”—or describing early crushes: “The swagger / behind their blue-tinted sunglasses and low-rider / jeans hurt boys like me.” Other subjects include Columbine, Tupac Shakur, iPods, and, above all, the condition and future of the black poet. In a final flourish of contrast, Jackson writes an epistolary poem to Gwendolyn Brooks, in a recognizable, albeit flexible, rhyme royal. In this newest volume of poems, Jackson (Leaving Saturn) takes aim with a series of free throws, exploring his North Philadelphia roots as he explodes over the urban landscapes of bars and oddities, basketball and poets, good friends and lost souls. A mixture of elevated diction and street language, Jackson's words inhabit "a paradise of kale/ and shakes root-dirt that snaps like a shadow lost in time." Often using rhymed accentuated verse, his lines seem to throb and pulse with the rhythms of the city and the game: "By a falling, Cyclone chain- / link fence, a black rush streaks/for netted hoops, & one alone / from a distance breaks / above the undulant pack. . . ." Two-thirds of the book comprises a series of poems, "Letters to [Gwendolyn] Brooks," written in rime royal, in which the poet offers his ideas of writing, musings of politics, and other philosophies, directing his thoughts to her in pieces arranged by neighborhoods, subway stops along the way. He and a friend believe that Brooks would want to be remembered in verse: "Not out for the epic, I want a vault / For my verbal wealth. I want a form / For my lyrical stealth." Jackson reminds readers that even in the decay of the city, there is much to see, to remember, much to appreciate. Recommended for contemporary poetry and African American literature collections.